Southeast Asia is renowned for its spicy, flavoursome food, but the drinks are pretty good too. Trying out the local beverages, whether alcoholic or not, is part of discovering the culture of a country. 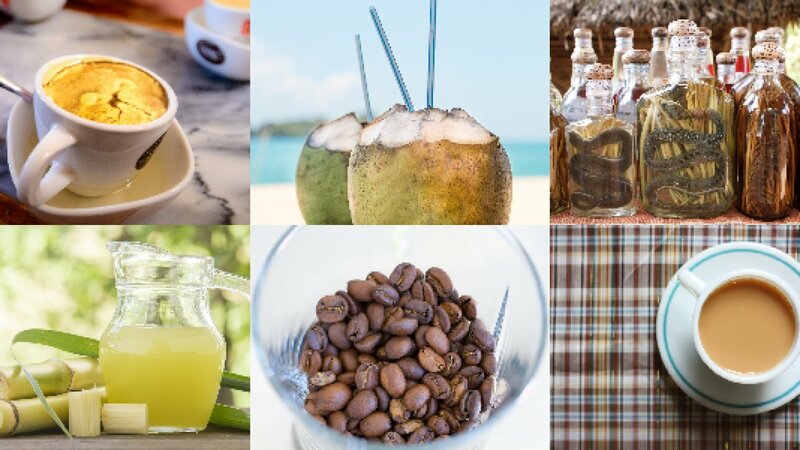 Staying hydrated is also vitally important, so if you find yourself dying for a drink in the heat of Southeast Asia, there’s plenty of options to quench your thirst. In Laos you can sample the locally-produced rice whiskey, known as lao-lao. Not far from Luang Prabang is a small village where you can see how traditional methods are still used to turn fermented sticky rice into the famous liquor. It’s cheap, extremely potent, but tastes surprisingly good. Be warned though, as often the whiskey is mixed with various ingredients such as insects and snakes before being bottled! 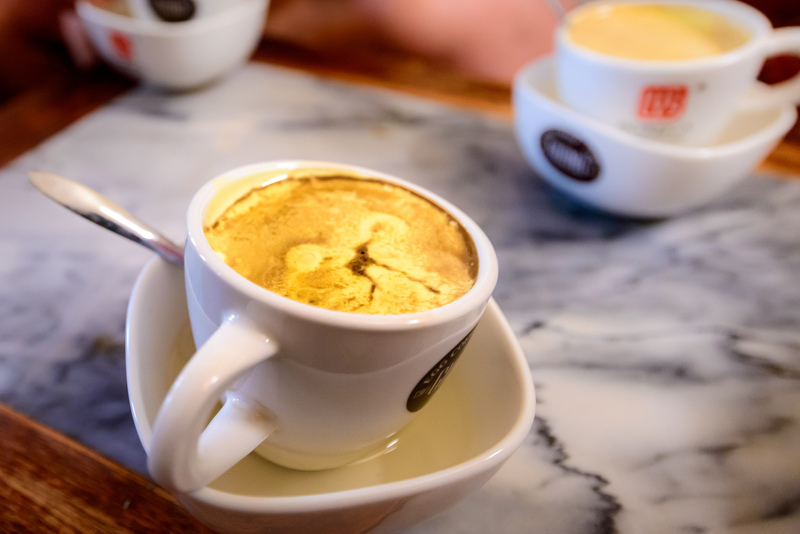 As much a dessert as a drink, Vietnamese egg coffee has been likened to liquid tiramisu. It is a deliciously decadent blend of coffee, condensed milk and beaten egg yolks. For the most authentic ca phe trung head to the Giang Cafe in Hanoi, whose enterprising owner invented the drink when milk was in short supply during the war. 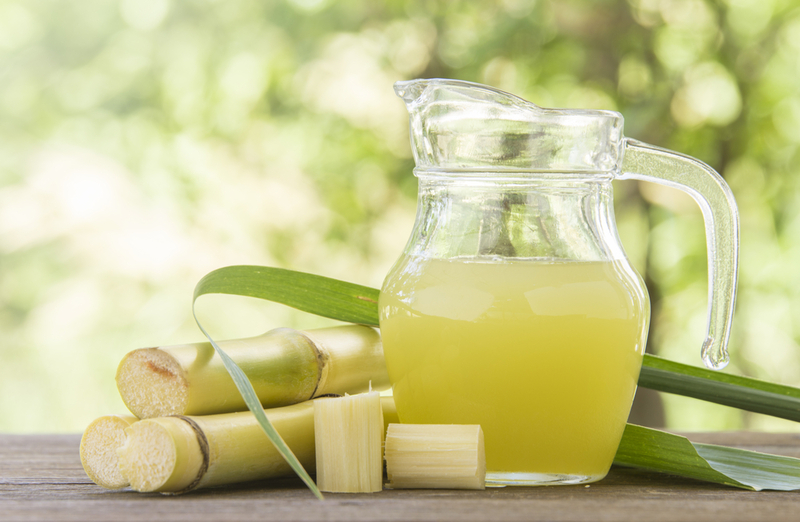 In many countries in South East Asia you will see street vendors with push-carts extracting the juice from long sugar cane stalks. The vendors squeeze the tough, fibrous stalks using ancient-looking hand operated machines. The resulting liquid is usually served in a plastic bag with plenty of ice. It’s sweet and refreshing and the perfect pick-me-up on a hot day. 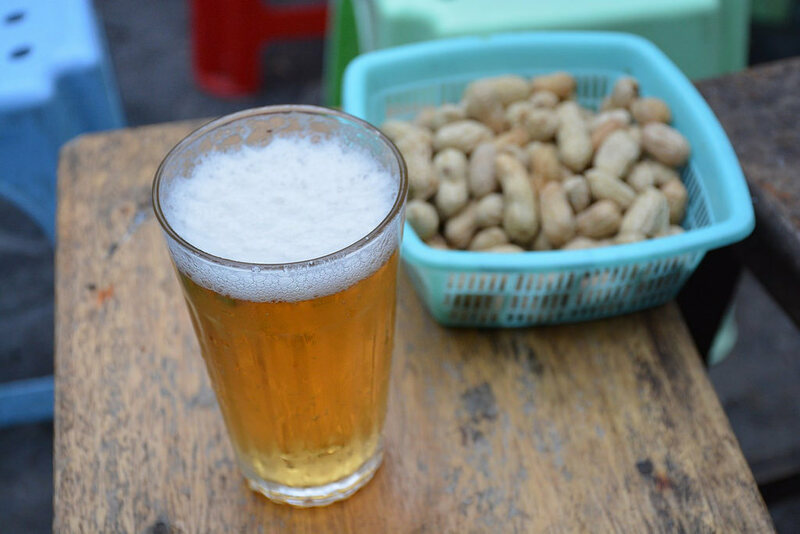 This Vietnamese street beer can be found on the street corners and in the roadside cafes throughout Vietnam. Containing no preservatives, the beer is brewed daily and a fresh batch is delivered every day throughout the towns and cities on the back of motorbikes. Sit down on a plastic stool at a street stall and enjoy the light yellow bargain brew as you watch the fascinating street life go by. 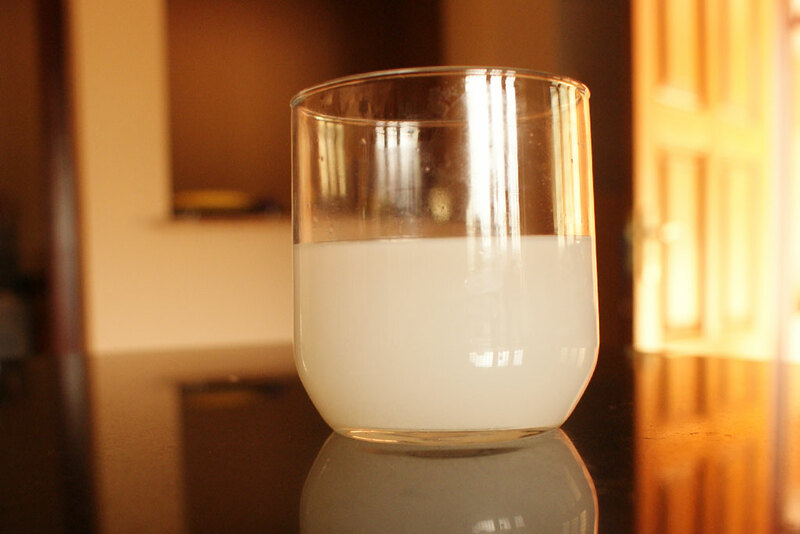 Palm wine, also known as toddy, is made throughout Southeast Asia, especially in India and Sri Lanka. It is made from the sap of various palm trees, a process known as ‘tapping’. The sap naturally ferments and within several hours of being tapped, will become alcoholic. Purists will always drink this potent liquor ‘on the rocks’, but feel free to add a dash of soda to make it more palatable! Made in Indonesia, this is reputed to be the world’s most expensive coffee. Which is surprising when you find out it’s made from the poop of a civet cat! The civets eat coffee cherries which are digested and then passed through their systems. The still-intact beans are collected, cleaned, roasted and ground. 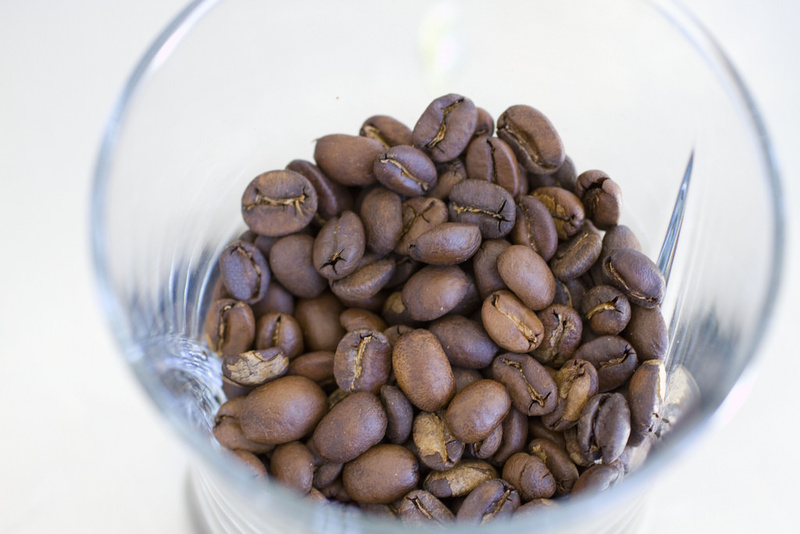 The entire process sounds strange, yet the coffee is said to be rich and earthy with hints of caramel or chocolate. Not one for the faint-hearted! 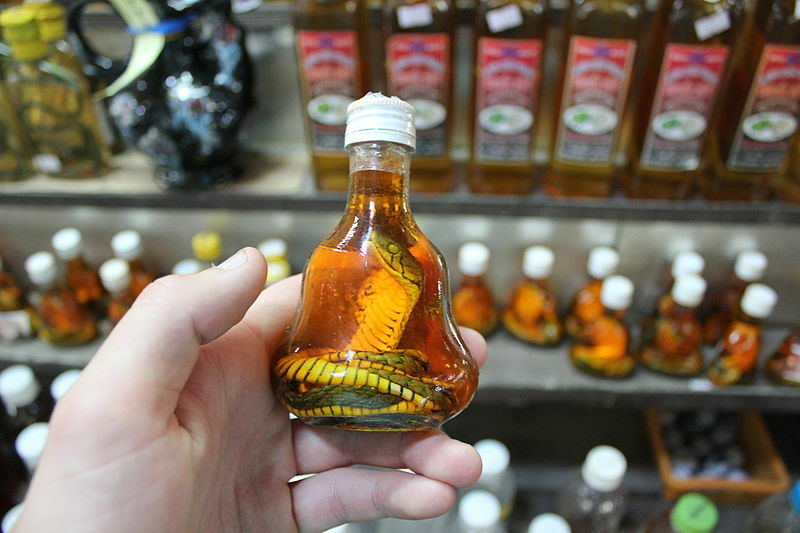 Snake wine is made by infusing venomous snakes in jars of rice wine. It is said to have originated in China but can now be found throughout Southeast Asia. It is thought to have medicinal benefits and can cure hair loss, eye problems and even low libido! 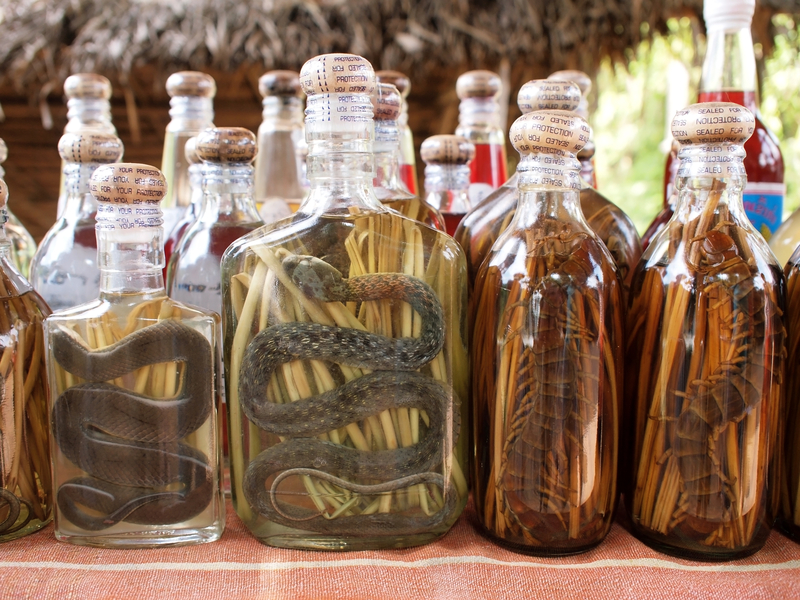 Brave drinkers can try a shot of this creepy reptile-infused liquor from street stall and markets. 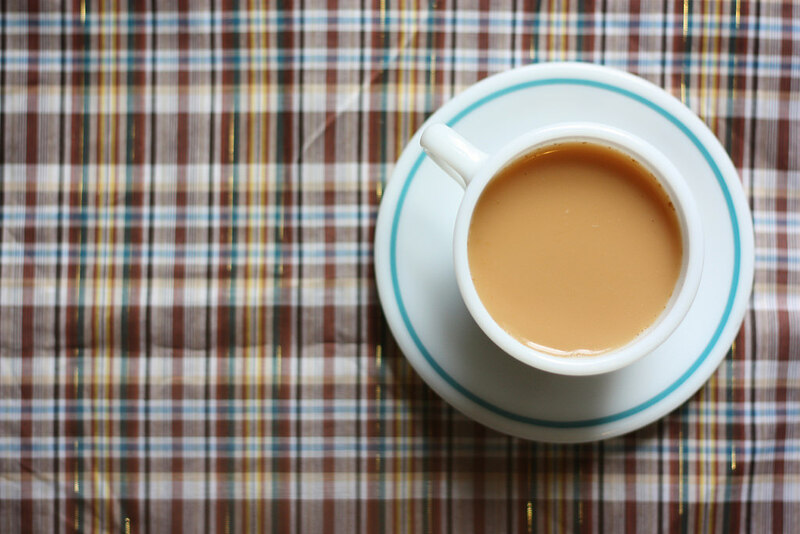 India has a long history of tea and one of the most popular brews in the country is Masala Chai. Indian spices such as cardamom, cinnamon, ginger and cloves are added to black tea and simmered for several minutes for the flavours to infuse. Then milk is added, usually buffalo milk, and the tea is sweetened with either sugar, honey or jaggery. We’re not talking about the packaged stuff that can be found on supermarket shelves. This is the juice of fresh young coconuts straight from the tree and sold from the back of pick-up trucks and on makeshift street stalls. It is an excellent source of natural electrolytes and can be even more rehydrating than water. 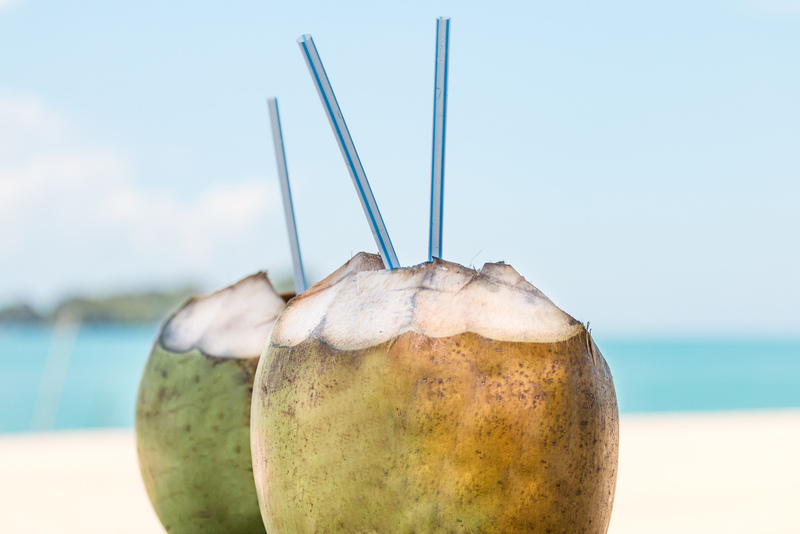 Put a straw in the coconut, drink the juice, then ask for a spoon to scoop up the soft white coconut flesh. There is a vibrant beer-loving culture in the region. 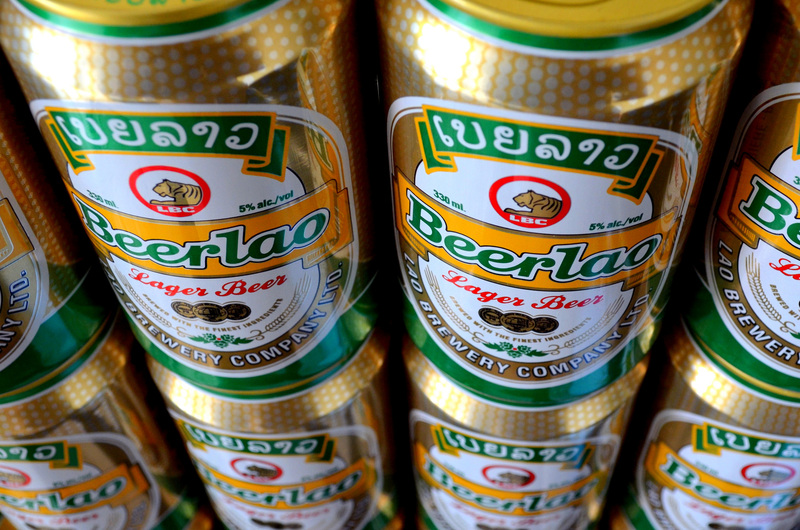 We particularly like Cambodia’s Angkor Beer, named after the iconic Angkor temples; Thailand’s strong Chang Beer (Chang means elephant! ); Myanmar Beer, the biggest seller in the country; Beerlao from Laos, described by Time magazine as Asia’s best local beer; and Bali’s Stark Craft Beer made using Balinese mountain spring water.